Pure passion. 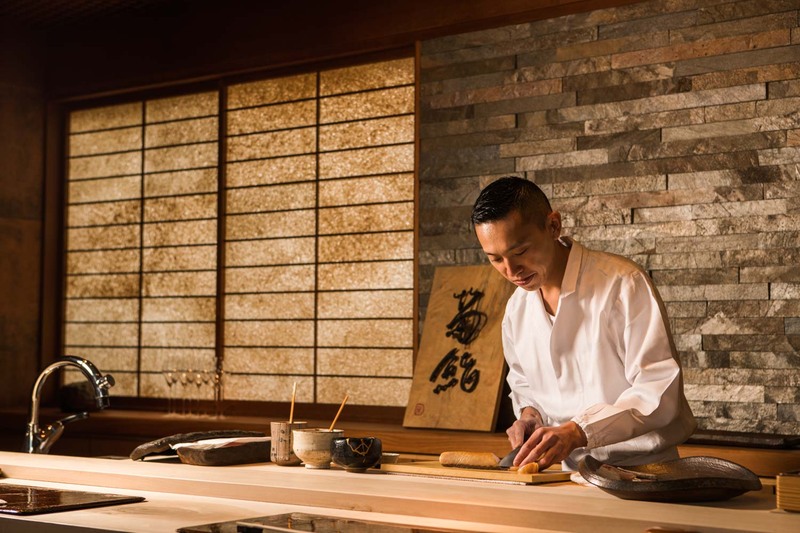 Perfecting every element as he faithfully adheres to the traditions of Edomae sushi, this extremely talented young chef works with the conviction of a veteran. With an unparalleled fastidiousness for the rice, warm freshly steamed rice aromas waft across the beautiful gingko counter whetting each guests’ appetite, bringing them into the process and building anticipation for the sushi dining experience about to begin. Hidden in a quiet neighborhood ten minutes from Hakata station on a local train, there is not another restaurant in sight. 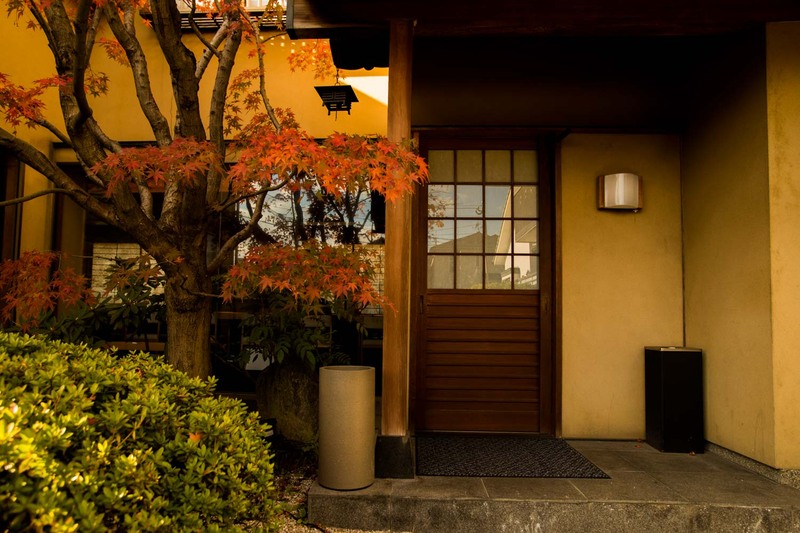 The entrance like a traditional Japanese home greets you, warming you with Japanese hospitality as you walk down the narrow laneway. The full glass windows on the left bring the countertop into sight and excitement wells within. As the wooden door slides open, energetic calls of irasshaimase welcome you to one of the ten counter seats, of which the centerpiece is a giant plank of ginkgo timber that forms the counter and inspired the whole interior. The surrounding stucco walls contain shells in the traditional fashion, and the rear wall is covered in a unique paper combining two traditional Japanese crafts – washi paper and lacquerware – affording a very strong sense of Japanese austere elegance and beauty. A beautiful pine bonsai is a snapshot of the great nature outside, the regularly changed ikebana perfectly captures the season, and a striking iron artwork with the characters for Kikuzushi sets the backdrop for the chef. There is harmony in the beautiful dignified space which is every bit as immaculate as the day it opened four years ago. It sets a scene that has your heart racing with excitement even before the first dish arrives. 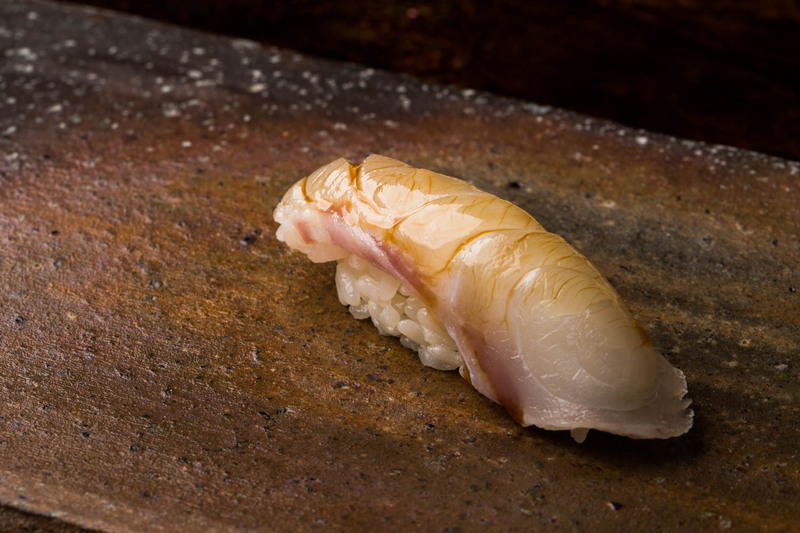 Kikuzushi exemplifies the Edomae style of sushi style with a firm emphasis on nigiri pieces. But the chef has an unparalleled fastidiousness for the rice. After you take your seat, piping hot rice is served into a large wooden platter to be seasoned. Dashes of red vinegar are lovingly incorporated so as not to damage the grains, turning it from pearly white to a soft brown hue with each turn of the paddle – a scene guests almost never have the pleasure of experiencing. The aroma alone makes you salivate in anticipation of what will make its way onto your plate. Chef Seguchi has a special relationship with a rice farmer who grows Hinohikari, carefully calculating moisture content in every crop, as the chef only excepts the rice that passes his very strict standards. Even then Seguchi insists on crushing a grain to confirm the moisture just before steaming. The larger than typical grains are steamed to leave some bite which ensures strong umami as it gets devoured. What seems like a performance element is not purely for performance. The chef strongly believes that the peak flavor of the rice is only possible for one hour. 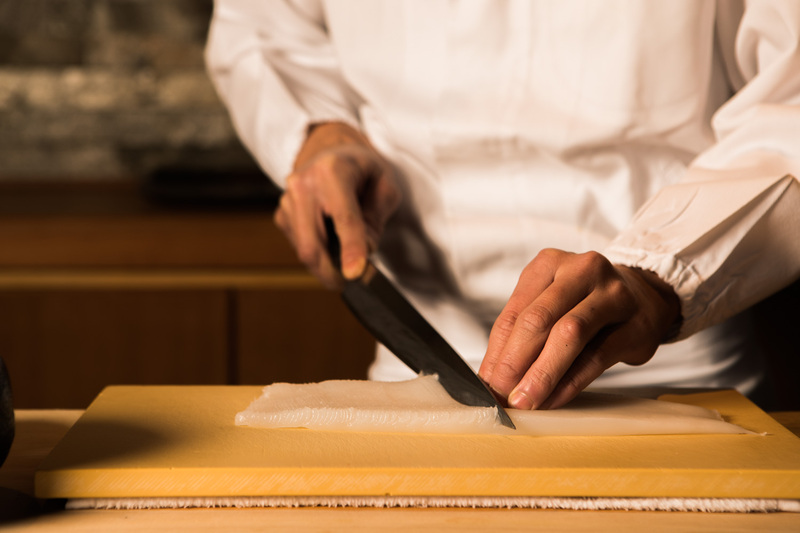 From steaming to seasoning and resting, when the rice has reached its perfect condition, the chef works quickly to give his customers the ultimate sushi dining experience. The lovingly prepared rice is then crowned, of course, with delicious fish gathered through well-nurtured relationships with brokers at the local market. Even then it is all about preparation and timing. 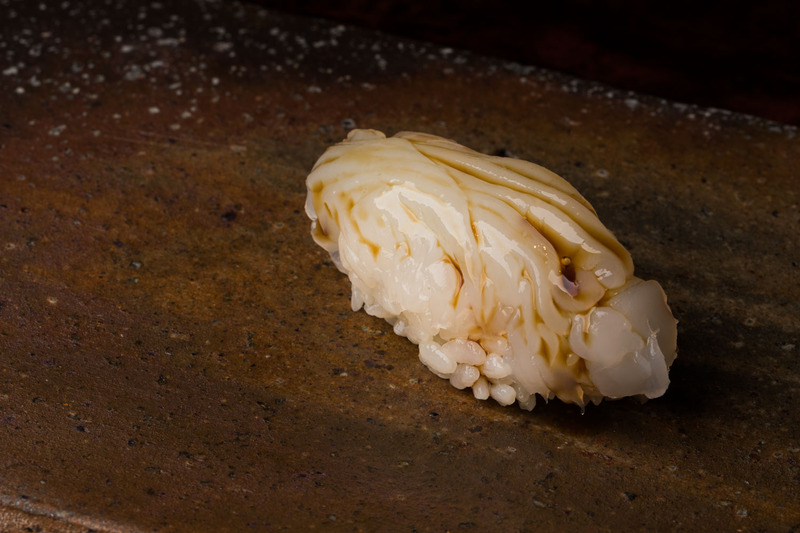 Aoriika squid from Kanesaki, a port on the northern tip of Fukuoka, is rested for 10 days to remove unnecessary moisture and condense flavors. The chef then inserts countless fine cuts thereby drawing out the sweetness from within. 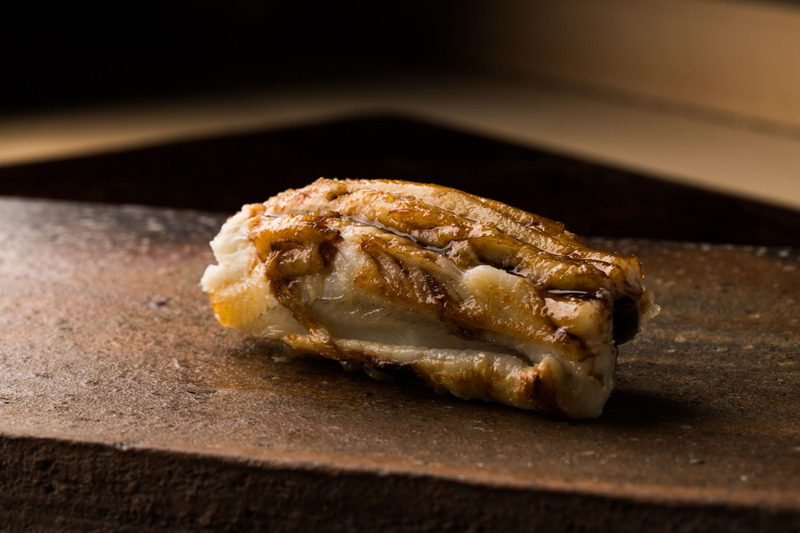 Shimabara, Nagasaki-caught amadai tilefish is pressed with salt and kombu to slightly dehydrate the flesh leaving only the most succulent pure flavors. Kue longtooth grouper from the clear deep waters around the Goto Islands weighs in at 14 kg and is rested for one week before service. 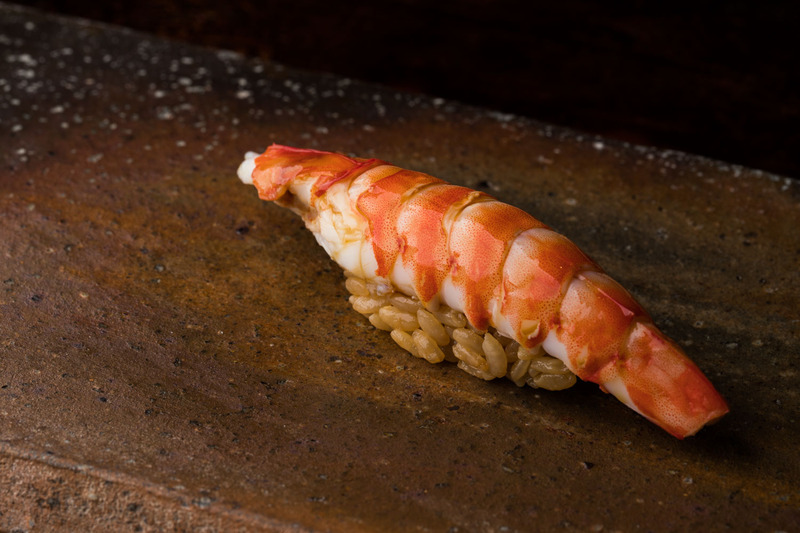 Plump shrimp called kurumaebi come from the Ariake Sea, with its stunning scenery tucked between Nagasaki and Kumamoto Prefectures, and the maguro tuna is a rare catch from Iki Island, Nagasaki. Tsushima anago is not a rare fish but finding small yet fatty conger eels is not easy with just a few for every several hundred caught. The egg omelette finisher is filled with the story of Seguchi’s toils to date and is something he spent hours researching and experimenting during his time in Monaco. With shrimp, white fish and sticky Japanese yam, the result is fluffy like many. And yet, this is entirely different – overflowing with flavor amid the creamy succulent texture, you will no doubt be begging for more. Seguchi is willing to bring in quality ingredients from wherever they can be found, but finds that the freshest seafood from the waters surrounding Kyushu comes through Fukuoka’s Yanagibashi Ichiba market, affectionately known as “Hakata’s kitchen”. He works hard to build relationships with fishermen but feels forever indebted to the brokers who supported him so wholeheartedly in his early days, so makes a specific point of entrusting all his transactions to them. Always searching for the best of the catches that are brought in, Seguchi’s respect for and careful nurturing of those relationships manifests in the most incredible selection of seafood for guests to enjoy at Kikuzushi. Yusuke Seguchi has a fresh youthful face with a strong aura of success and satisfaction. But behind his air of comfort is a story of twists and turns which, while deeply challenging, underlie the success that he is today. Kikuzushi was opened by Seguchi’s father 35 years ago, and moved to its current location a decade ago. Seguchi used to hang around the kitchen and when it became apparent that his older brother would not take over the restaurant, he decided he would. During junior high school, Seguchi was obsessed with baseball, but by the time he graduated from high school he was ready to take up an apprenticeship at Ugyoku, which at the time was one of Hakata’s top three sushi establishments. He spent ten years there building the foundation of his career, and just as he thought he might try his hand in Tokyo, an invitation came from the most unexpected place. Famed French chef Joel Robuchon had taken a strong liking to Japanese cuisine and needed help opening his new Japanese restaurant in Monaco. 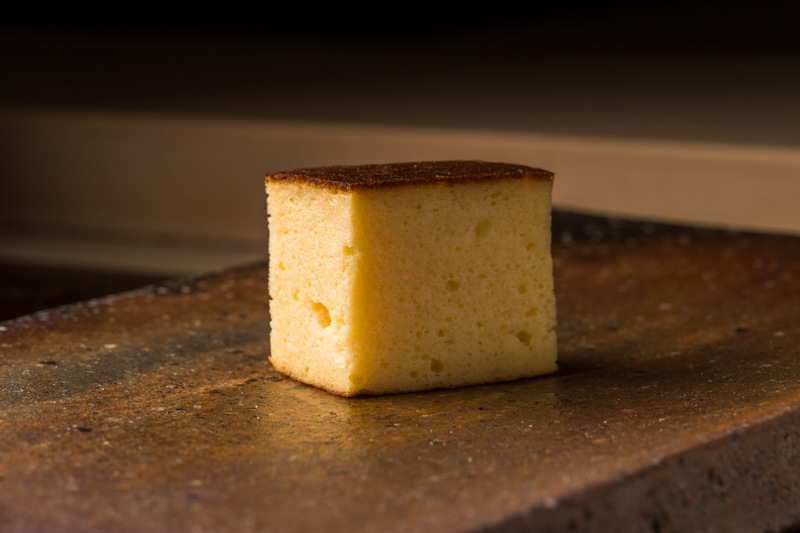 Alone in a new country and grappling with both French and English, Seguchi was charged with teaching the basics of washoku to the Robuchon team. Highly acclaimed for his work, he was even invited to make sushi for a royal family wedding. Seguchi returned to his native Fukuoka two years later to take over his father’s sushi restaurant, and charged with every role from chef to management, he was suddenly faced with his biggest challenge yet. Nestled in a quiet neighbourhood, many locals ordered sushi to be enjoyed in their homes. Their expectations were for tempura and all kinds of other dishes too, and that prices would remain unchanged. Seguchi couldn’t see how to make the business work and thus after two years at the helm he borrowed whatever he could from the bank and set about reinventing his restaurant. 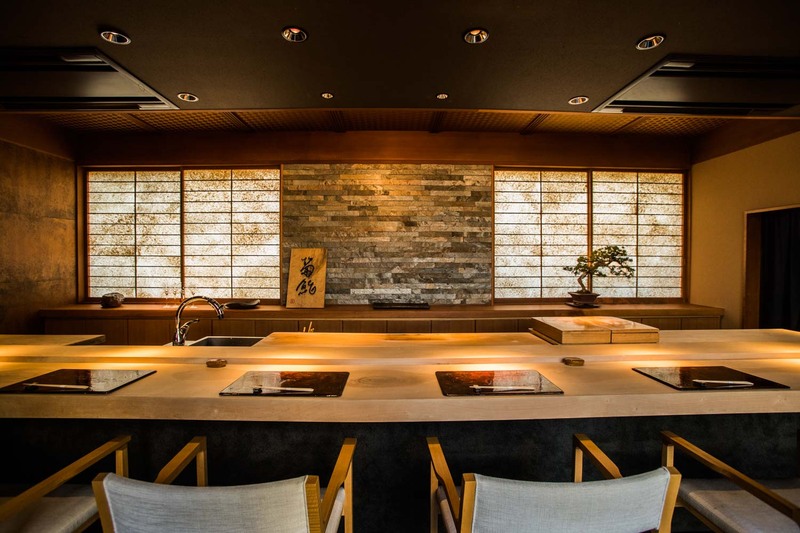 The encounter with the splendid gingko timber that now serves as his counter served as his impetus and he set about creating his own Kikuzushi as he wanted it to be – sushi only, with meticulous attention to the seafood and rice. Quiet days and months of trial and error ensued, until gradually word spread of his diligence and talent, propelling the restaurant to the thriving space it is today. Despite being just 34 years old, Seguchi understands well his guests and their needs, and is driven by the pure desire to find and create the very best for them every day. Chef Seguchi feels a strong sense of pride in the art of sushi and wants to share it more broadly with the world. 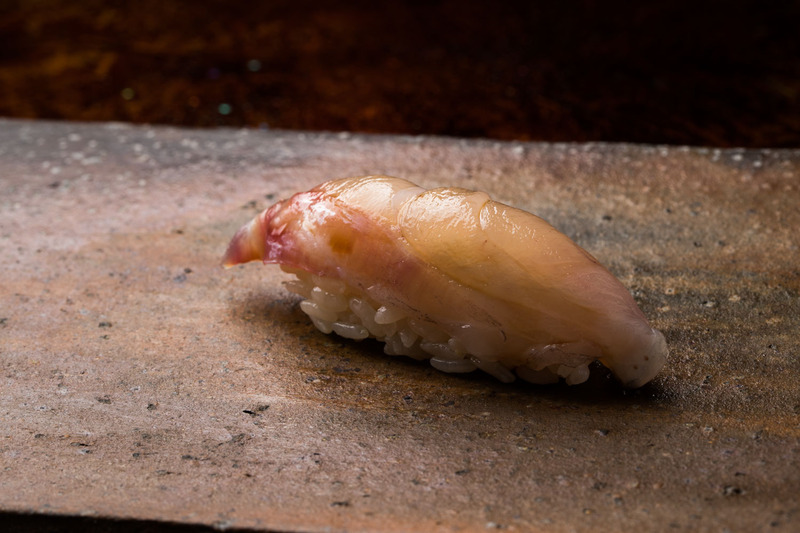 While for Seguchi now the emphasis is absolutely on Kyushu seafood, the desire to spread sushi culture means a willingness to use ingredients from all over Japan. And with an eye to possibly opening a restaurant overseas someday, his more immediate wish is that many more foreign customers may visit his special pocket of sushi culture here in Fukuoka, Kyushu. 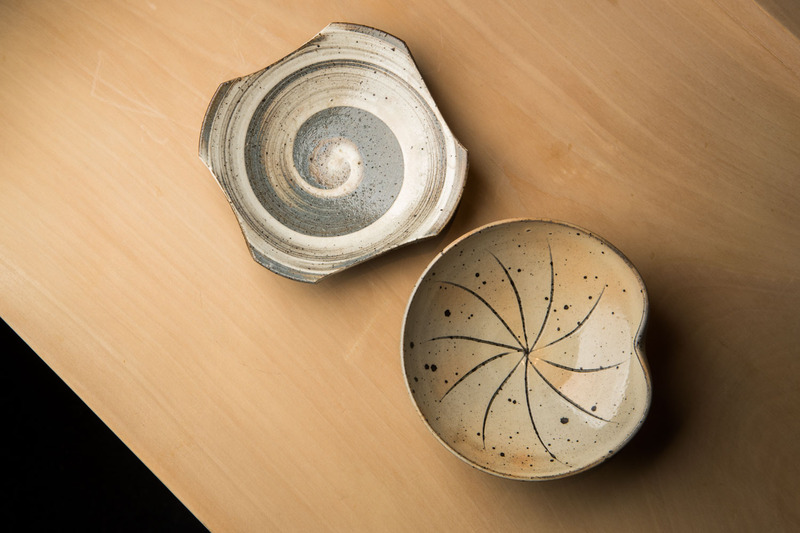 Chef Seguchi is especially fond of Karatsu ware from neighboring Saga Prefecture, a center for pottery since the late 16th century, and has been gathering the pieces in his collection little by little through orders placed directly at kilns, as well as visits to exhibitions. 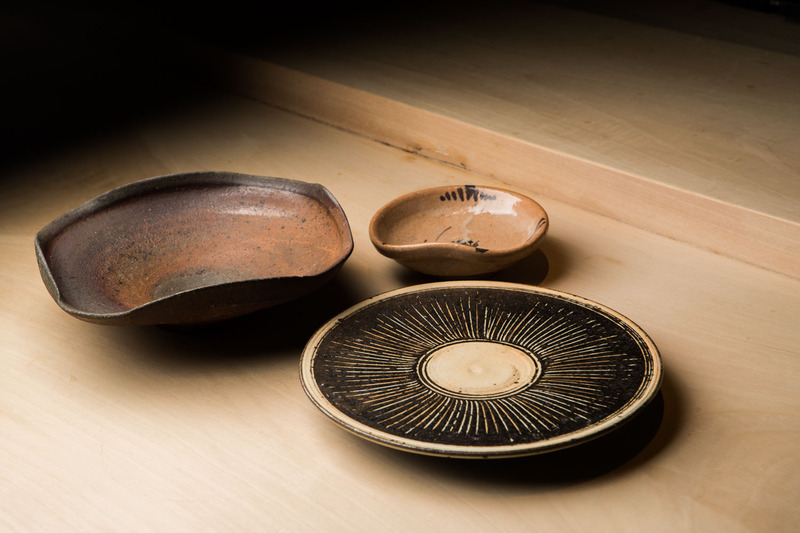 Considered one of the best types of pottery for Japanese tea ceremony, Karatsu ware exemplifies the Japanese aesthetic of wabi-sabi, which prizes objects for their asymmetry, roughness, and simplicity. Ryutagama is one of Seguchi’s favorite kilns, and it is there that father and son work the clay to the sounds of a bubbling brook and wild birds. 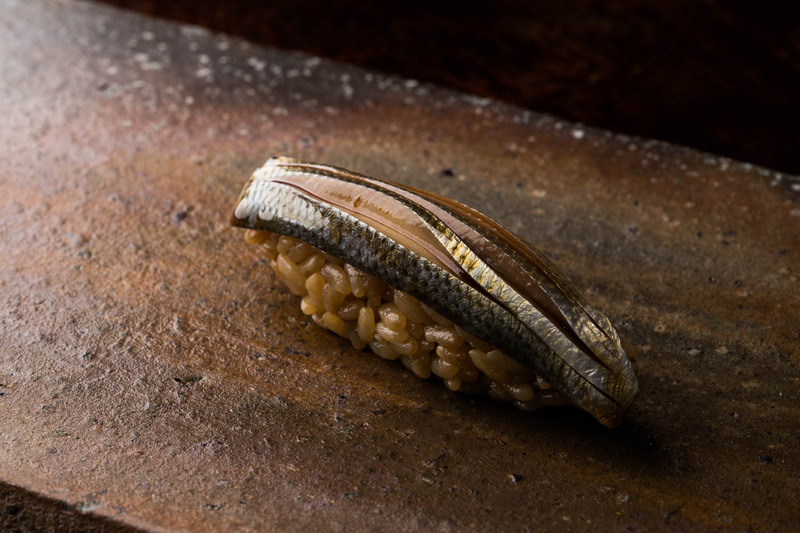 Their pieces have an earthy natural feel that Seguchi feels is a perfect match for his sushi. The restaurant is rich in natural materials at every turn and Seguchi’s choice of tableware is no different. It assimilates perfectly into the ambience he has created bringing about a very strong sense of unity.